Health savings accounts are popular health benefit plans, but did you know they can also play a critical role in retirement savings? Helping employees plan for retirement health care costs is critical to their long-term financial well-being. Fortunately, there’s a savings vehicle that can help solve for both current and future health care needs: the health savings account (HSA). 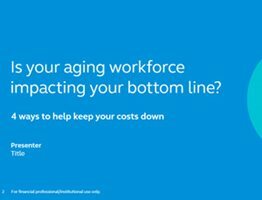 Use the insights and resources below to deepen your conversations with employers about health care costs in retirement and the potential uses of HSAs. A health savings account (HSA) is a tax-advantaged trust or custodial account created for the benefit of a qualified individual. HSAs can be an integral part of retirement planning since the funds can be invested long-term. 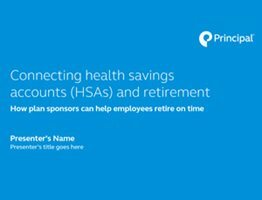 In fact, 75.3 percent of employers view HSAs as part of their retirement benefits strategy.2 Plus, HSAs are triple tax-advantaged and can help reduce employers’ current health care costs. 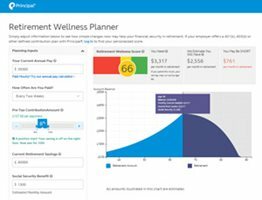 The majority of employees use health savings accounts to pay for current out-of-pocket medical expenses.3 Only 9% of employees use the account to invest for their long-term health care needs.3 There’s a need for more education and awareness of the value HSAs provide as part of a holistic retirement plan. Need some help with your conversations? Use these resources. 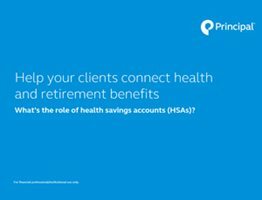 Discover the role HSAs can play in long-term health care saving and retirement wellness. Learn how designing a plan around retirement readiness can help lower health care costs and improve retirement wellness. For employers, HSAs make efficient use of your entire benefits package by covering both health and retirement. Find out how. 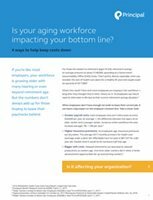 Is your aging workforce impacting your bottom line? Many would-be retirees can’t retire on time due to lack of retirement savings – including saving enough to cover health care costs. See how the two are related, and what you can do about it. Track your HSA alongside your other retirement accounts for a better picture of your overall financial health. 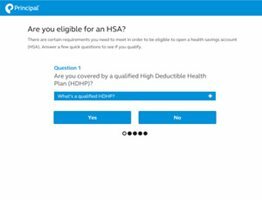 Answer a few quick questions to see if you meet the requirements for having an HSA. 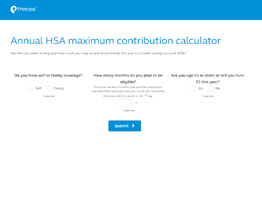 Calculate how much you may be able to contribute this year to an HSA.